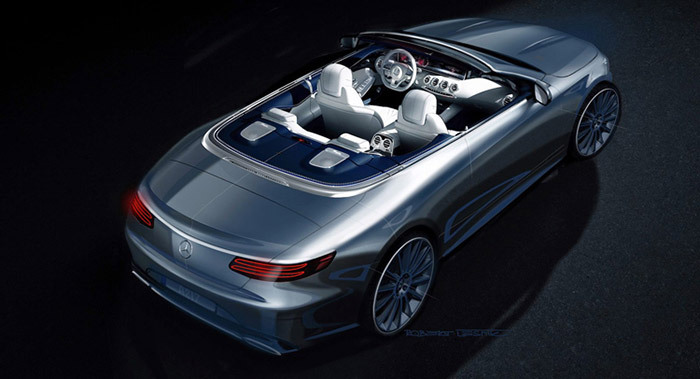 The next expected car from Mercedes-Benz is 2016 Mercedes S Class Cabriolet. The car is going to be the first flagship 4-seater convertible to be created by the the car maker since W111 series open top S-Class derivative stopped its production in the year 1971. This car could be regarded as the latest member of the ever expanding Mercedes Benz S Class family which currently currently has 5 derivatives and shall make its debut at Frankfurt Motor Show in September. Mercedes Benz has also released the official teaser sketch. The prototypes of all new Mercedes-Benz cabriolet were first spotted testing earlier with their soft tops on, the renderings of the car showcases the uber luxury automobile with its top down. When it comes to the car’s design, it is essentially a S Coupe sans roof and pillars. The Interior of the car is shared with other existing members of the family. A flat bottomed steering wheel and the sports seats are the other special features of the car. Mercedes-Benz has till now not talked about the powertrain lineup. One could safely assume that the top-less S Class shall derive its engines as well as the transmissions from its Coupe sibling. Range topping Mecedes-AMG models will be made available in two different flavours – The S 63 with a power of 585 PS which comes with Biturbo 5.5-litre V8 and S 65 with a 630 PS Biturbo 6.0-litre V12. In fact, there are no direct rivals for 2016 Mercedes S Class Cabriolet.Also the car would enjoy its very own niche in the global luxury car segment. Mercedes-Benz India has also launched S Class Coupe and S 63 Sedan models in the recent few weeks, and is all set to get the Maybach variant out, meaning it could bring more expensive niche models in the market. If you are fan of Mercedes-Benz, you could expect S Class Cabriolet to enter India in few months time after its global launch.